If you are looking to get a start-up and flow test for your diesel-driven fire pump, we’ve established a simple checklist to make sure nothing is missed. Save yourself the headaches, time, and cost of having to have multiple trips by ensuring each item has successfully been completed before the arrival for your test. We’ll begin our checklist with the most commonly overlooked items below. 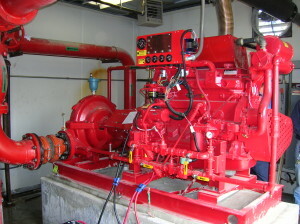 120 volts of power is brought to the fire pump controller, and a separate power source is hard wired to the engine block heater. DO NOT ENERGIZE THE BLOCK HEATER! Ensure the fire pump controller is wired to the engine junction box according to the instructions inside the panel door. You need 50 foot 2½ inch hoses and U.L. Playpipe nozzles with 1¾ inch tips brought to start-up with one hose per 250 gpm rating of the fire pump. You’ll also need a way to secure them. If you have Hose Monsters®, these are acceptable. The air release valve and pressure gauges are properly installed. You have a separate drain line going from the packing collection point that’s under each bearing arm to a frost-free location such as a drain. The unit is properly mounted and secured, with the base of the pump grouted with non-shrinking grout. You cannot have any pipe strain on your fire pump. There’s a reliable source of water piped to the fire pump, and the water supply lines are properly flushed. If you don’t properly flush these lines, stones and debris could damage the fire pump. You’ll need an electrical power source hard-wired to the jockey pump control panel. DO NOT USE THE MAIN FIRE PUMP CONTROLLER AS A JUNCTION BOX FOR THE JOCKEY PUMP POWER FEED. There needs to be wiring from the jockey pump control panel starter to the jockey pump motor. Ensure the jobsite voltage is verified for the jockey pump, and all electrical inspections have already been completed. Use the proper engine fuel, which is typically No. 2 diesel fuel. The fuel lines will need to be piped to the engine, without copper or galvanized piping, according to the manufacturer’s instructions. Your control panel sensing lines are installed according to the NFPA 20. Check to make sure the fire pump manufacturer representative is bringing a volt/amp meter and tachometer, as well as calibrated gauges. You’ll also need the owner or representative, insurance inspector, Fire Marshall, and fire pump representative scheduled. Ensure the fire pump representative is responsible for scheduling controller and engine representatives. The battery cables should be installed by an authorized diesel engine technician. Following these steps closely will give you a seamless start-up and flow test for your diesel-driven fire pump. If you run into any snags along the way, need clarification on one of the items, or have any questions don’t hesitate to reach out and contact our team of experts here at Steven Brown & Associates. We’re more than happy to assist you! Posted in Fire Pumps, Jockey Pumps, NFPA and tagged Diesel Fire Pump, Fire Pump Controller, Flow Test Checklist, Start-up and Flow Test, Start-up Checklist on August 6, 2015 by admin.